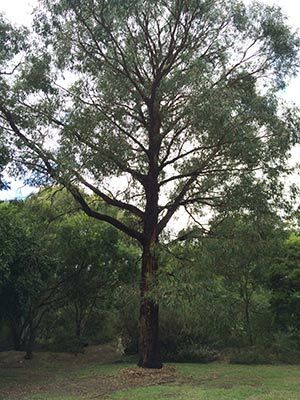 Eucalyptus radiata – Narrow Leafed Peppermint. 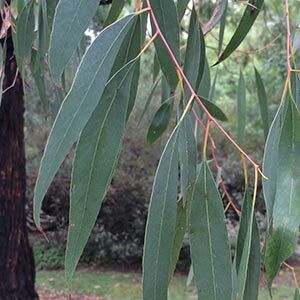 Eucalyptus radiata or Narrow leaf peppermint is a popular tree with landscapers. Upright habit with a good straight trunk and a compact dense crown it makes an excellent shade tree. Available from wholesale growers in sizes from tube stock to small trees. Tube stock are best planted from autumn to early spring using a tree protection guard to prevent damage from rabbits. Tolerant of most soil types including poor soils. Used as a shade tree in larger gardens and parks as well as a street tree. A good tree for windy exposed sites. Aromatic foliage, and small creamy white flowers from late spring until mid summer. Used as shade tree in parks and larger gardens, also for roadside plantings. Excellent in native gardens where it attracts birds and insects. Growing with a straight trunk and featuring rough figured bark, as the tree matures it develops a slight pendulous or weeping habit. Eucalyptus radiata – Narrow Leafed Peppermint – Foliage detail. Soil – Well drained to wet. Tolerant of poor soils. Aspect – Full sun although tolerant if shade for part of the day. Attractions – Rough grey bark, dense compact crown, drought and frost tolerant once established. Flowering period – Late summer. Eucalyptus radiata or Narrow leaf peppermint is available for sale from the following wholesale nurseries.